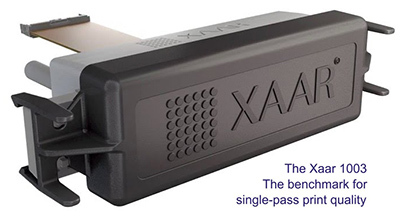 The Xaar 1003 printhead offers printer manufacturers and end users several unique technologies from Xaar which deliver the high-quality print and reliability demanded. These include XaarGuard, which provides additional protection to the nozzle plate, thereby dramatically reducing the frequency of maintenance; also incorporated is Tuned Actuator Manufacturing which ensures that actuator performance in each printhead is optimized. This delivers uniform print quality across all printheads in a print bar, and at different greyscale levels. Xaar’s unrivalled TF Technology ink recirculation, ensuring ink flows past the back of the nozzle during drop ejection at the highest flow rates in the industry, is also included within the Xaar 1003 printheads. TF Technology keeps the ink in constant circulation, preventing sedimentation and subsequent blocking of the nozzles during jetting – and guaranteeing that the printhead operates reliably even in the harshest industrial environments. Alongside this, High Laydown (HL) Technology helps the Xaar 1003 printhead to produce dimensional effects that deliver additional impact to a range of print applications. “With the Xaar 1003, our printers produce excellent results. The unique TF Technology in the printhead has enabled us to develop different systems for a wide range of applications, ensuring high print speed while maintaining excellent print quality,” comments said Mr. Xu Qun Bo, Deputy General Manager of Coaso. “Each printer incorporates the Xaar 1003 printhead and operates with the ink supply system developed by us. The printhead’s print quality and reliability make it the ideal choice for this range of industrial applications and we believe it will fast become the first choice in the market,” concludes Mr. Xu Qun Bo. Covering over 140,000 m2 and with over 1,200 exhibitors, Print China is one of the most influential industrial printing shows in China, displaying the latest technologies in the printing industry to a global audience.